Just setting up for Funding Journalism with Jesse Brown and Zahra Sethna. Welcome to the session, Funding Journalism. As with the theme of the conference, the theme of the talk is change. 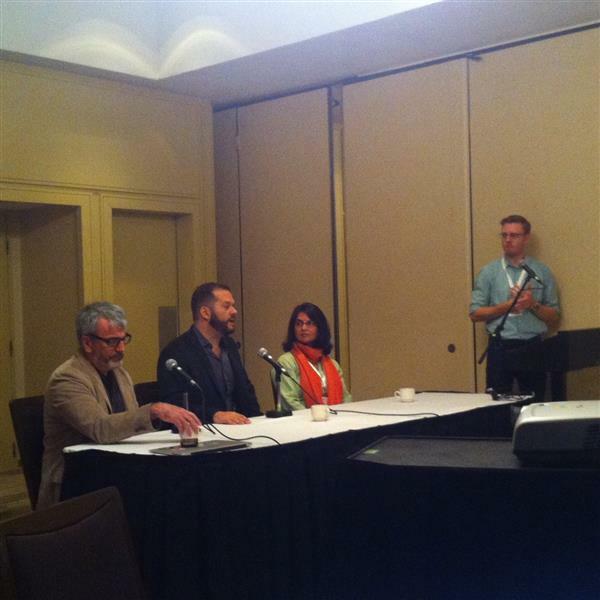 The panel consists of Zahra Sethna, the editor and co-founder of Rustik Magazine, Jesse Brown, the founder and creator of the Canadaland podcast, and Tim Bousquet, the founder of the Halifax Examinor. Sethna and her husband started Rustik Magazine with her husband. "We didn't want it to be a blog," says Sethna. They wanted it to contain journalistic endeavours. Check out Sethna's magazine here. Brown says he set a goal of $10,000 for his publication, and launched Canadaland in 2013. About half of the Halifax Examinor's content is behind a paywall. Bousquet says the content is exclusively online, with many freelance contributors. Brown's project of Canadaland has grown into including a political podcast and regularly produces media criticism. "The nail in the coffin for my previous job was when they had me write editorials," says Bousque. "That was too far." He says the Halifax Examiner has no advertisements because he refuses to include them on the site. If you check out the Halifax Examiner, you can see how it's ad-free. Brown says he pitched different versions of a media criticism project to platforms such as the CBC and Maclean's Magazine which he now sees as a risk. "I did find a corporate sponsor for the first little bit," says Brown. "We now have a full time investigative reporter." You can see Canadaland's unique crowdfunding model here. Sethna and her husband did a lot of research to make sure their concept would be original and would work. An online lifestyle magazine was not around at the time. Sethna pitched their idea around but was rejected. She says they decided to take on the project themselves. Through events and niche publications, they sought to attract and audience online. Early in his career, Bousque says he started a small town newspaper in California for five years which cost a lot of money to print. "There is more stuff for us to cover than we have the resources to cover," Brown says. "The investigations break whenever they need to break. We are providing a service," says Brown. "At the core of it will hopefully be a podcast that will grow whenever it needs to grow." Brown says it's necessary to keep finding new listeners and at least maintain a current audience to keep a podcast running. Brown likes the platform Patreon the best, over many other crowdfunding sites. He didn't want one lump sum of money for an entire year. Brown says Canadians are listening to podcast as young people want to listen to something to speak to them. He says there is a great opportunity in making podcasts today. Bousque says big stories drives subscriptions, but they are hard to predict or trigger. "They come when they come." Sethna says they have a team of a web designer, a web developer and contributors who have helped built Rustik Magazine. "We want to keep growing those kinds of relationships but organically." "We can only do as much as our capacity will allow," says Sethna. Sethna and her husband have additional jobs outside of Rustik Magazine. Brown says that beyond crowdfunding, he did not know how his podcast project would pan out. "There is advertising on the show but because the majority of the show financing come from the listeners ... the more fun it is." Rustik Magazine hosted Canada's first ever food and word festival in Chester, NS. Sethna says Rustik Magazine's original idea was to keep the site free. "Social media is what drives traffic to our site so we need that sense of community." Brown says 25,000 is the average number of downloads of Canadaland, but that is an imperfect metric of who is listening to the show. Two to four thousand people financially support the show. Brown's true passion is for audio, despite a history of broadcast and print, and it all started with This American Life. "Podcast advertising is having a moment because it is a very effective way of advertising," says Brown. "It's a throwback to the [golden] days of radio."